Home Article WATCH: "That was close!" 12-year-old girl tried to throw herself off a building, SAVED! The 12-year-old girl suffering MDD (Major Depressive Disorder) tried to throw herself off a building. 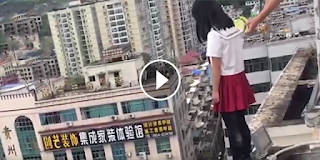 Watch how her principal pulled her back from the dangerous rooftop. Approximately 0.5% to 1.4% of people die by suicide, about 12 per 100,000 persons per year. Three quarters of suicides globally occur in the developing world. Rates of completed suicides are generally higher in men than in women, ranging from 1.5 times as much in the developing world to 3.5 times in the developed world. Suicide is generally most common among those over the age of 70; however, in certain countries those aged between 15 and 30 are at highest risk. There are an estimated 10 to 20 million non-fatal attempted suicides every year. Non-fatal suicide attempts may lead to injury and long-term disabilities. In the Western world, attempts are more common in young people and females. Another life has been saved. Please share if you liked this story.